Very often, when you are trying to download a software product from some web site, you are given a choice of a 32- or a 64-bit version. (Note that most of our products do NOT require such a selection: they detect the "bitness" of Windows and install the appropriate files automatically for you.) Still, if you need to know the flavor of Windows that your computer is running, how to find it out? The System Properties window shows the Windows "bitness" information. 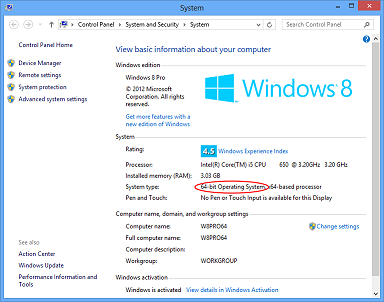 OK, that's how to do it on a Windows 8 computer, what about the earlier versions of Windows? You can do the same steps, only instead of File Explorer launch Windows Explorer (that's how it was called before Windows 8). Or, you could open the Start menu and right-click on the Computer (or My Computer) item there, to display the shortcut menu with the Properties command. 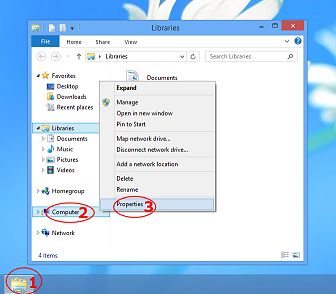 Note that if you have Windows XP, then the System information may not contain the "bitness": if so, you can safely assume your computer is running a 32-bit version of Windows XP. Now, when some web sites asks you to choose between a 32- or 64-bit download, you will know how to make the right decision.